Search Results for "venice beach b roll"
Cinematic 4k b-roll footage. Distance and far view of Melbourne city skyline from Brighton Beach during bright summer daylight. Sandy beach, clear sea water and colourful bathing box. Enjoy this beautifully immersive aerial footage of the famous Huntington Beach pier at sunset, captured in stunning 4K. Quality themed presentation or B-Roll material. Slow motion B-Roll of Pink Flowers in Seal Beach, CA. slow motion b roll. of a firefigher helmet washed away on beach by waves and there were all sea creature stuck on it. A beautiful beach sunset captured in 4K aerial footage. Perfect for themed presentations, storytelling or quality B-Roll. Practically dip your toes in the wet sands of this Southern California beach at sunset in beautiful 4K footage. Perfect for themed presentations, story telling, adverts and B-Roll. Aerial perspective of the Huntington Beach Pier at sunset in southern California in stunning 4K Ultra HD. Perfect for your themed presentation, story telling, adverts or B-Roll footage. B-roll of the wood of the Bogue Inlet pier on the beach at Emerald Isle, North Carolina. Cinematic b-roll footage of Brighton Beach at Melbourne during bright summer daylight. Join the dinner party on this luxurious mega-yacht on the shores of Miami, Florida, captured in stunning 4K footage. Perfect for that themed project or quality B-Roll. 4k cinematic b-roll footage of rock formation along the coastline, The Twelve Apostles at Great Ocean Road, Australia during beautiful sunset. 4k b-roll footage of clear blue ocean and green trees at Lombok Island, Indonesia. Floating at the port of Ensenada, Mexico, captured in beautiful 4K UHD. Great for themed presentations, storytelling or quality B-Roll. Tropical tree leaf B-roll shoot. Surfers getting their last sessions in, captured in 4K aerial footage. Great for storytelling, themed presentations and B-Roll. Slow motion B-Roll of a small front yard palm tree in South Central, CA. 4k cinematic b-roll footage of unique rock formation along the coastline during a cloudy sunset - The London Bridge at portsea, Mornington Peninsula, Victoria Australia. 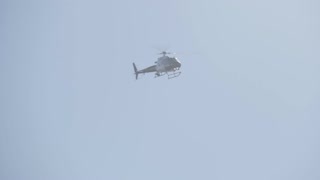 VENICE BEACH - Circa December, 2018 - A helicopter patrols over Venice Beach. VENICE BEACH - Circa December, 2018 - A low angle establishing shot of people using the Venice Beach bicycle path. Shot at 60fps.